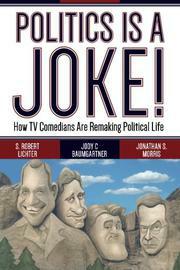 Political humor on late-night TV is serious business, as three academics show in this study. Listed as lead author, Lichter (Communication/George Mason Univ. ; co-author: The Global President: International Media and the U.S. Government, 2013, etc.) is the director of the Center for Media and Public Affairs, which has been tracking political humor on TV for a quarter-century, compiling a database of 102,435 jokes from 1992 through 2011. Why 1992? It inaugurated “the golden age of political humor”—partly due to the change in the mainstream media culture, which now felt free to report salacious details of private lives that might previously have been kept secret (giving JFK, FDR and others a comparatively free pass), and partly due to the variety and latitude afforded by cable. Perhaps most importantly, however, was the ascendance of “scandalizer-in-chief” Bill Clinton, who “easily trumps his competitors as the all-time favorite target of late night comedians.” The academic prose by committee, augmented by graphs and charts, provides a jarring contrast with the edginess of the jokes, many of them still very funny (if dated). There is some provocative conjecture on how the negativity of the jokes (which almost all of them are) affects the public perceptions of the politicians and the process as a whole, though the authors admit that their work “shows how difficult it is to sort out the relationship among news, jokes and candidate evaluations” and that “if the jokes follow from the news, then it may be the news that is having the real effect.” Yet this study could well serve as a resource for other cultural analyses written in a livelier fashion, and it should be required reading for political strategists whose candidates’ images are both shaped and reflected by TV humor. Astutely analyzed but dryly written. Not exactly a knee-slapper for the general reading public, though its insights will find their ways into the mainstream media.